What should be done: If you are not using MyISAM, ignore this one. If you do use it, modify the key_buffer_size variable and increase it to accommodate the index in the memory. What should be done: Indexes usage is a key indicator to understand if you write your queries in a way that utilizes your indexes and if you defined correct indexes to support your questions. Enable your slow log query and examine your queries. What should be done: Seems that this is not a critical variable, since you must check it is relevant in your case. 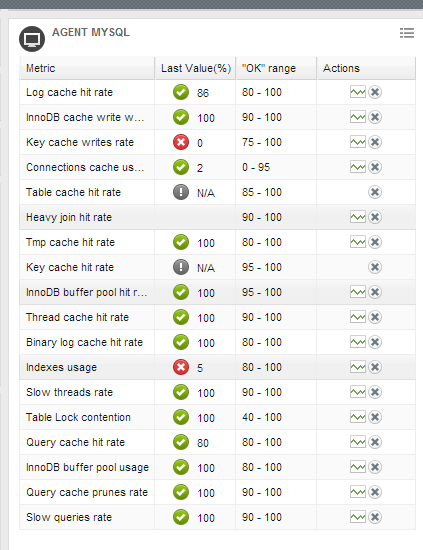 If you believe that your system business case should use most data out of cache and value is low, modify the key_buffer (MyISAM) or innodb_buffer_pool_size (InnoDB). Monitoring system is critical component of critical systems. However, in most cases you should verify that the default configuration matches your business case (and if it is the case, take care the alerts! ).